OK… So it’s time to start the next Do-It-Yourself project. Now you need to gather the materials necessary to complete the job! Well, first, do NOT leave home without your Click & Carry. Here are five creative ways Do-It-Yourselfers use Click & Carry to make their work easier. 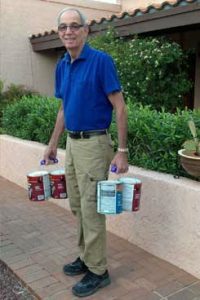 Click & Carry is ideal for carrying paint cans and construction pails. 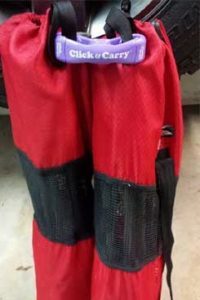 Each Click & Carry can hold up to 80 lbs. (both statically and dynamically). Check out our photo of an over-achiever pushing the boundary by carrying two 68-lbs. pails for a total of 136-lbs. Note, we don’t advise carrying so much weight, but carrying home two one-gallon paint cans from Lowe’s or Home Depot will certainly be a breeze! Many Do-It-Yourselfers find treasure troves of goodies at flea markets. It’s a DIYer dream to find something old and abandoned and make it shiny and new once again! Click & Carry aids in toting all those “upcoming projects” home to the refurbishing lab so you may breathe new life into someone else’s discarded garbage. Here’s a fun trick for you Do-It-Yourselfers… Check out the last 10 seconds of this video clip from the HGTV show called “I Want That…”. It shows a smart woman organizing her purses in the closet – you could even organize and store crafting tools/equipment (yarn, paint, paper, etc.) using a Click & Carry. Spring is coming and it’s almost time to begin your yard work! 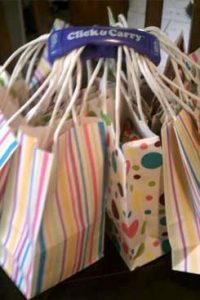 Click & Carry is a necessary tool to tote the bags of concrete, dirt for the garden or even the tool bags filled with shovels, hoes, mattock and pick, trowel and bulb planter. Click & Carry is ideal to carry heavy bags of concrete for that pesky sidewalk project and for the rock salt needed to clear your driveway in winter. Click & Carry can help you to transport heavy items for your next DIY activity, whether you’re going to the beach, river or mountains. I’ve worn heavy pieces by creating a make-shift carrier tethered together with a Click & Carry and some belts or straps. Get the kids’ surfboards from the car to the water with less hassle! We know our customers find other ways to use their Click & Carry handle devices – we get photos from around the world. That has inspired our Click & Carry Creative Use Photo Contest, running through March 31, 2017. If you have a way you think is unique, we encourage you to enter!